In a large skillet, cook the ground turkey over a medium heat, stirring frequently to break up. Add the sliced mushrooms to the skillet and cook for another minute. Add the chicken stock, stir well and heat until it just starts to bubble. In a small jug or bowl, rapidly whisk the milk into the konjac flour to make a slurry. Add the slurry to the meat mixture and stir well. Stir constantly while the sauce thickens. Once thickened, simmer the sauce for 10 minutes. Meanwhile, heat the coconut oil in your largest stock pot and sauté the leeks over a medium heat, stirring frequently until they wilt. Turn the heat to low and add the julienned squash. Toss the squash / zucchini and the leeks together well and let the squash warm through. Add the salt and pepper, oregano and white wine vinegar to the meat sauce and stir well. Pile the squash and leek mixture onto plates and spoon the meat sauce over the top. 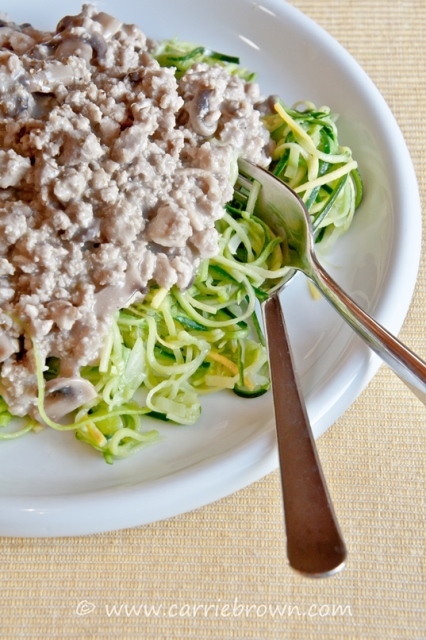 If you cannot find ground turkey, ground chicken can be substituted. Feel free to increase the number of non starchy vegetables used in this recipe to make it super SANE!